Early 2016 data out, and the signs are…? This is an interesting time for data nerds. It’s been a crucial few weeks for the market. There were some strong headwinds making themselves felt towards the end of last year. But then came the Christmas break and the January lope-along, and it wasn’t clear whether things hadn’t gone worse, gotten better, or stayed the same. So right now, each week gives us a better read. The fear of course is that the APRA restrictions and a clamp-down on capital coming out of China might drag down property prices, the way a cheetah drags down an antelope. And there were definitely signs if you were looking for them. An Auction clearance rate below 50 last week in Sydney certainly got tongues talking. But my read is that things have held up. It’s still early days obviously, but I’m not seeing the danger signs that others are seeing. First up, auction clearance rates posted a solid bounce this week. Last weeks shocker in Sydney was based on an unusually small number of auctions – just 59. This weekend we were back up to a more normal 265 auctions. And the clearance rate (percent of successful auctions) was also a lot better. In Sydney is was back up to 70%. This is a decent result. We’re not looking at the volumes and clearances rates that we say at the beginning of 2015, but we’re generally still up on 2014 – which itself was a strong year. So anyway, the point is that if you’re looking for support for the idea that the property market is crashing, the auction clearance rate data just isn’t going to give it to you. And taking a look at the chart for the combined capitals, you’d have to say things look steady. We’re holding around the elevated range that was established in 2013. Similar story if you look at the RP Data leading index. This is measuring mortgage activity, so while the auction clearance rates give us the best read of what’s happening right now, the leading index gives us a feel for what is going to happen. And I noted a few weeks ago that it had also taken a hit in the early part of the year, dropping of a cliff to some of the lowest levels in several years. There’s always a dip in the new part of the year, but even then it looked pretty grim. But since then, it’s come back in a decent way. We’re still not at the levels we saw as 2015 closed, but we’re still clear of the lower levels we saw in 2012 – which you might remember wasn’t a bad year for property anyway. So same story again. It’s not a pumping result, but it’s certainly not one of the four horsemen of the apocalypse either. And so the story that seems to be emerging is that the property market is holding ground. The break tested us, people got nervous. But the market overall has held its nerve, and activity remains solid. I can hear a few sighs of relief. There has been a bit of troubling news around rents though. RP Data released their rental report and said we’re looking at the slowest growth on record. Rents across the country were flat in the year to January. That’s zero annual growth. And if you put growth in unit rents aside, rents for detached houses actually fell 0.3% in the year. However, this national picture hides a few stories. If you break it down city by city, you can see that the poor showing is largely being driven by Perth and Darwin. Rents for houses in Darwin are down almost 14%, while in Perth they’re down 8.5%. 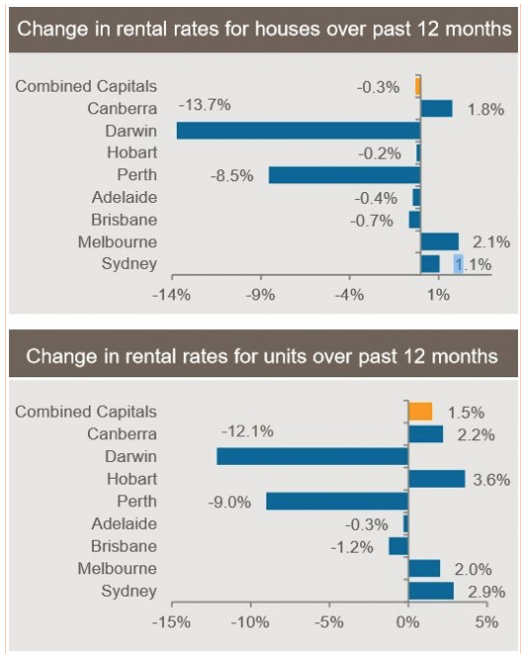 Both cities saw rental prices soar during the mining boom years, and so these falls represent a reversion to trend. Though, we have seen a solid construction boom in Perth as well, so glutty conditions will be suppressing rents as well. Not to say rents are exciting in other parts of the country. In most places they’re flat at best. 2.1% in Melbourne houses is pretty decent though. There’s not a lot to get investors excited here. But it’s not fire and brimstone either. Rental growth has been sluggish for a few years now, in line with ho-hum income growth. And while we’ve had factors like a boom in foreign buying supporting prices, we haven’t had an influx of foreign renters. So rents remain tied to domestic income, which is puddling along. These days I’m looking for ways to manufacture rental growth. I’m not banking on much market growth at all. Anyway, the short of it is that market conditions appear to be steady. The worst predictions of January just don’t seem to be borne out in the data. Its still good to have your wits about you, but I think we can give the panic button a rest. Anyone been to any Auctions recently? How did they look?